Maryland Gov. 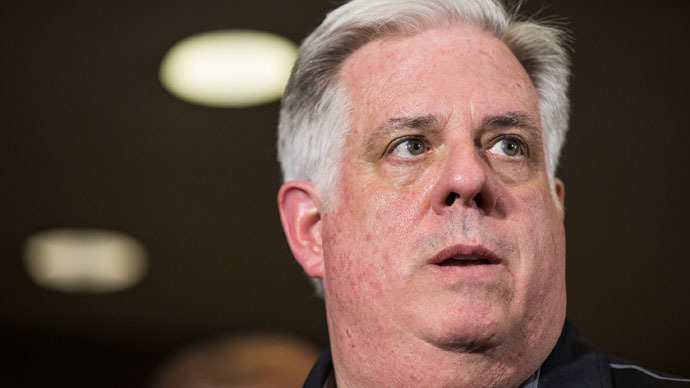 Larry Hogan stunned lawmakers by announcing he will redirect $68 million set aside for schools and use it to shore up the state's pension system. But critics say his move violates appropriation rules under the state's constitution. On Thursday, Gov Hogan said that spending more money on schools instead of covering the underfunded state's pension would be "absolutely irresponsible, and it will not happen on my watch," according to The Baltimore Sun. However, opponents argue there is a drawback to this plan because, under the state constitution, the governor can't decide to transfer money that has been appropriated for a specific purpose by Maryland's General Assembly. In this case, the $68 million was set aside for education and only education. If Hogan chooses not to spend the money on education, it would have to remain in the bank and could not be allocated to cover pensions, Maryland House Delegate Eric Luedtke (D-Montgomery County) told RT. The education fund was created to support schools that require more money to educate a child, and often the children are from urban settings like Baltimore. "He's [Hogan] cutting money that goes to schools with the most poor kids, kids with disabilities, and second language learners – all the impacted urban populations," Luedtke said during a phone interview. "Under the Maryland Constitution, he can't apply funds that have been appropriated for something else. What he will probably do is let the money sit in the fund and then use it as his proposed budget next year. In the meantime, there are kids in Baltimore, Montgomery County, and Prince George County that need a good education." Luedtke said schools in these areas “are already announcing cuts. They are already announcing they are increasing class sizes and cutting teaching positions." For his part, the governor said Maryland is already spending record amounts on education – $7.5 billion on K-12 education each year – while cutting spending at other agencies. But critics said there was no indication that state pension system was underfunded. Baltimore was due to receive $11.6 million for its schools from the fund. Luedtke said the governor's decision was atrocious timing because, just weeks earlier, he said he was willing to help in Baltimore during protests over the officer-involved death of unarmed black man Freddie Gray. When push comes to shove, Luedtke said "he's not there for Baltimore." While the roots of some of the problems in some Baltimore neighborhoods run deep, Luedtke said good schools would help people rise out of whatever conditions they are in. Luedtke said Hogan also voted on May 13th to spend $30 million, through the Board of Public Works, on constructing a new jail in Baltimore. "The next day, [he] made the announcement he was going to cut the education fund," said Luedtke. "It is a striking contrast." RT asked Luedtke whether the state's pensions were in trouble. "The [pensions] were in trouble. But we took up major pension reforms in 2011, and they were underfunded, but we are on the track to be fully funded again. It is a slow climb with a multi-million dollar fund that we owe money to, but the state expects that by the mid 2020s we will be above our 80 percent funding core," he replied. "I would argue there isn't a problem. I would argue that our reforms in 2011 helped us take care of the problem with the pension system. He's just spending money in the wrong place." RT contacted the Maryland governor's office for comment but have not received a response.